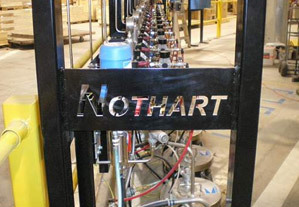 ﻿ Nothart Industry Sectors | Food Processing | Nothart Engineered Sales Ltd.
Nothart is honored to be able to serve this sector of our economy with high quality Brands since 1953. If you are looking to service, build, or renovate a food processing facility, we have ideas and solutions for you. Maybe you need to move hot oil for chips or pizza pops; provide vacuum for a ham, chicken, turkey, beef or fish processing plant; process any of the many grain/vegetable crops, or process other raw material, or simply isolate an area for dust or temperature, for your food industry. We are also able to spec and provide high pressure pumps for Sanitary cleaning applications. We would like to earn your business, with one of our many reputable equipment brands. We look after many different types of clients, and their processes. This gives us a unique perspective on how to solve your current opportunity, by bringing experience and best practices to bear without exposing proprietary methods. Please call us as opportunities arise.